A five metre king cobra was caught inside a restaurant in Krabi by plucky rescue workers yesterday. Krabi Pitak Pracha rescue workers arrived at the restaurant to find the restaurant staff and customers outside the restaurant. A staffer says that the king cobra was found at the back of the restaurant inside the kitchen. A rescue worker used a snake snare to catch the 5 metre reptile. It took about 20 minutes to catch it. It is believed to be about 15 years old. 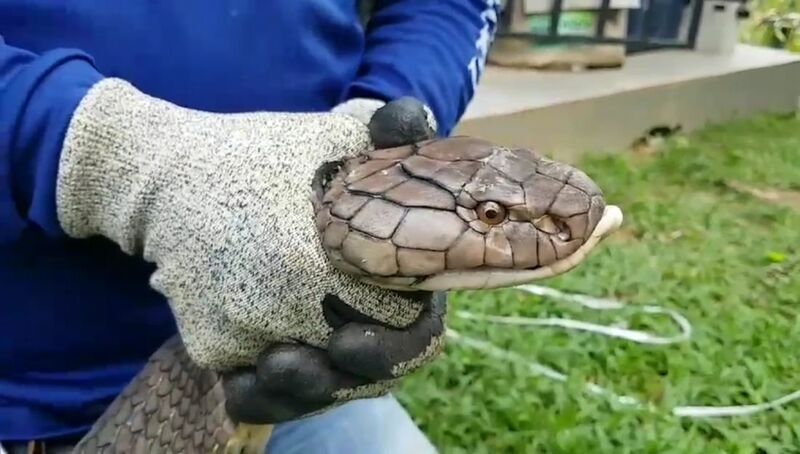 A 20 kilogram, 5 metre king cobra was caught by a skilled rescue worker with his bare hands in Krabi last month. Not recommended!